Before I get completely into the actual muvee Reveal review I think with this software it is important to understand not just what it does but also exactly who it is designed for. Over the past ten years or so the major video editing software companies have been developing and adding features to their products at breakneck speed. This development has been conducted in an atmosphere of fierce commercial competition and has not always been driven by what is specifically needed or wanted by the consumer. In fact often the driving force has been the intention to produce something with a “Wow!” factor to get the sale rather than functions people would really use. Regardless of why that development has occurred the result has been a steady process of complication and complexity being added to these programs and to their respective user interfaces. For the average person who has little or no interest in either the process of editing or in an almost professional level of features, this presents an often bewildering barrier to them using that software. Having said that, this does not mean that Reveal is in any way crippled or lacking in necessary or desirable features. If you are looking for complex, advanced controls so that you can enjoy fiddling around with video on your computer for hours on end while your husband / wife / significant other walks around the house scowling at you then no, this is not what you are looking for! However, if you want to quickly and painlessly put together a professional looking video without getting bogged down in technical terms or an endless array of options, then muvee Reveal Encore is most likely a good fit. The process is very straightforward and begins with Reveal Encore allowing you to easily import your videos and images into a central library. You can use video clips or images from almost any source such as smart phones, your webcams, camcorders, digital SLR camera or whatever. What you don’t need to do is give a second thought to such things as those videos or images having different sizes, different formats or even aspect ratios or resolutions. In fact you don’t need to know what aspect ratios and resolutions are! The software has the ability to detect and synchronize all of those differences whether you have a widescreen video with an aspect ratio of 16:9 or a standard video that has an aspect ratio of 4:3. Once everything is imported you can then organize them into individual folders for different projects. You then choose the assets (video clips, images and any music tracks) that you wish to incorporate into a project by just clicking a button. After you have selected your source material, you then need to choose a style. A “style” is like a template that you use to determine the overall “look” of your final movie. I will talk more about the muvee Reveal Finale styles later in this review but at this point you click again and sit back for a second or two while the software creates your video for you automatically. The creation process involves the software scanning all the videos and images you have selected and arranging them into what should be a logical sequence. At the same time it syncs the music track you have selected to not only the overall length of the video but so that editing cuts and fades occur in time with the music. A good range of free music tracks are included with the program. Once this has finished you will be presented with a completed video which you can then preview. If you like the finished product you can go to the next step or if there are changes you want to make then you can manually make those changes with very easy to use tools that are available. 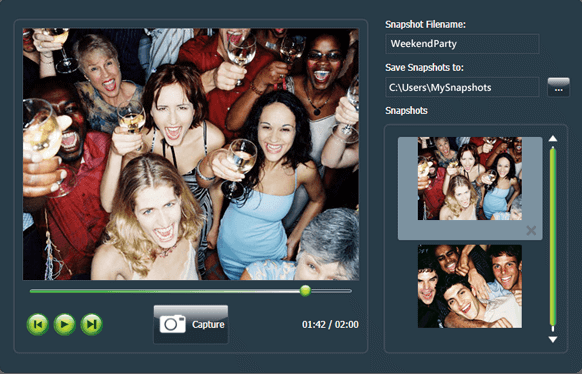 Once you are happy with the project you can share your video with others by burning it onto a DVD, save to your hard drive or portable device or upload it to YouTube or any other video sharing site. In keeping with the automatic theme of muvee Reveal Encore, even the Sharing options are totally painless. No need to bother about all those complicated output settings and video file choices at this point! Just tell the software what you want to do and it will automatically put it together correctly. Muvee even has a dedicated site where users can share their videos. If you want to add some personal touches with titles, credits, captions, or even voiceovers, you can easily do that after the preview in a few easy to follow steps. Here is a quick video demonstration of what the software can do. Instead this version is just a matter of improving the existing product as it is. Professionally designed title sequences have been added which include their own music tracks so you can just add some text and look like an editing genius… well maybe not a genius but you can look pretty good! You can now take any existing style from within the software and perform a wide range of customisations to each one to get your project looking the way you want. If you like the way you have adjusted one of these styles then you can now save that customization for future use whilst the original style is left intact. You can set a faster pace to the project, selecting a specific color filter or even change the default font and background colors. The program includes a wide range of stickers from frames and borders, to hand drawn embellishments, to even light sparkles, fireworks and cute stickers for kids. You can then save a new photo with these embellishments for Facebook before using them in your muvee slideshow. You can now zip up your projects in their entirety, transfer it all to another machine and continue editing without loss of anything. It will zip up all the photos, videos, and music content along with all settings, captions, titles and every imaginable detailed setting of your projects into a single file, and continue where you left off on another machine. Now you can choose images directly from any of your video clips and save them by clicking on the “Capture” button.